When Heidi and her husband decide it’s finally time for kids, everything goes just as planned. Heidi, a teacher, needs a summer baby, and her baby girl is set to arrive mid-July. Heidi, an athletic young woman, suffers almost no morning sickness, no disruption to her routine. Still a nervous expectant mother, she is reassured that at each of her check-ups, her growing baby is not just healthy--she is perfect. So when Heidi wakes up on the night of June 30th, blood covering her sheets, she can’t believe that something less than perfect has occurred. When the same doctors who told her not to worry now inform Heidi that her daughter will be stillborn, she is at a complete loss. Cradling her baby’s lifeless body, Heidi realizes that she and her baby--her Avery--will never have the lives she envisioned. When Heidi finally seems recovered enough to leave the hospital, she goes home to face a world which is full of traps for a woman mourning her child; babies at the grocery store, new students asking about her baby, other women who say all of the wrong things, and worse--women who say all the right things. Because nothing for the Chandlers feels right with Avery gone. Heidi has to figure out how to navigate her home, her family, and her friends, familiar territory that suddenly feels strange. 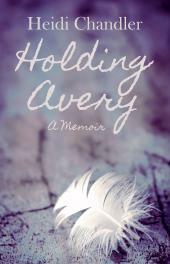 Holding Avery makes Heidi’s incredibly private pain something universal, an assurance that in the face of loss, the only thing to do is move forward.